Physical Description: 339 pages ; 22 cm H 8.37", W 5.5", D 0.8", 0.74 lbs. Miserable and lonely, husband and wife Scott and Rachel find comfort in a pair of online friends, unaware that the woman behind each creation will stop at nothing to make Scott and his family her own, even if it means getting rid of Rachel...for good. (Original), 368pp. What if you could create your perfect friend? One who literally was always available? 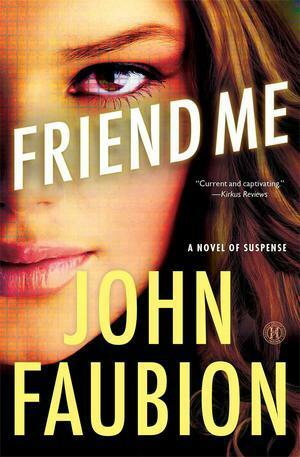 That's the driving question behind John Faubion's suspenseful tale of the seductive power of technology, Friend Me. The fictional Virtual Friend Me software takes email or social networking sites and goes one better: allowing users to create the friend or companion they seek. Scott and Rachel Douglas, parents of two, succumb to the software's promise. Given her husband's long hours at work, Rachel needs someone she can talk to, so she re-creates the best friend she lost to cancer. Scott sees what the intriguing new software offers his wife, and, in a life-altering decision, chooses to create a female friend. Unsurprisingly, things take an intimate turn. Little do Rachel and Scott know that Melissa Montalvo, the woman behind the cutting-edge software, has taken a personal interest in the couple. Convinced that Scott is the perfect man for her, the unhinged Melissa begins a systematic effort to break them up by any means. The twists here are numerous, and the revealed details of Melissa's backstory grow more disturbing. Though the characters are somewhat sketchily drawn, their dissatisfaction and mistakes lead them plausibly down a very wrong road. Will they be able to change course before it's too late?. Melissa Brown. 368pg. BOOKPAGE, c2014. Advances in social media technology beg the question "Who's watching?" So, watch out. Faubion's thriller is a timely novel about the risks to privacy inherent in Internet communication; its pornographiclike capabilities to watch and interact from afar; and the social repercussions for a family experiencing the typical economic strain of our times. Melissa Montalvo is a software architect with some seriously disturbing personality traits. The book begins with a murder and her rise in the ranks of Virtual Friend Me, a company that takes avatars to a new level by creating a lifelike image of a "friend" who learns about the user through interaction and becomes more human in the process. Scott Douglas and his wife, Rachel, are distancing themselves through work and marital stress. They each create a "friend" through the website and spend more and more time with their virtual others, ignoring the issues in their life together. Behind the screen is Melissa, intercepting emails and stalking her perfect man, Scott, electronically. Fantasy becomes psychopathic, and Melissa emerges in the real world physically working to rid Scott of Rachel and creating the life she imagines with him, regardless of the murderous events needed to get there. The story is current and captivating but with a purpose: Faubion fills the pages with biblical quotations and Christian teachings. The book captures well our insidious addiction to social media, but the novel's pace is slowed by morality lessons and a predictable conclusion. 368pg. KIRKUS MEDIA LLC, c2013. A cardboard villain, who commits a murder with little motivation early on, and an unconvincing online companion made from code mar Faubion's debut, a novel of suspense. VirtualFriendMe.com offers Rachel and Scott Douglas, a couple struggling in their marriage, online outlets for their frustrations. Rachel creates a virtual version of her deceased best friend, Suzanne, while Scott creates "Alicia," devoted to supporting him in all matters, including questionable investment decisions. After all asks Scott, "What could go wrong?" But all of Rachel and Scott's interactions are actually driven by a software architect, Melissa Montalvo, who has a deadly real-world agenda--make Scott her own and eliminate Rachel. Scott and Rachel determine who Melissa is through a number of improbable assumptions; a confusing timeline and alternating points-of-view make the final showdown hard to follow. Agent: Linda Glaz, Heartline Literary Agency. (Feb.). 368p. PUBLISHERS WEEKLY, c2013.